Glabridin is a whitening cosmetics additive, which was the first invented by the Japanese MARUZEN company in 1989. After years of use, it shows obvious effect, good safety. So in the cosmetics industry in the world, it is known as "white gold". Glabridin is one of the good curative effect, fully functional whitening ingredients, and one of the main active components in the current international high-end whitening cosmetics. In addition to the Japanese cosmetics company, Sabinsa company in the United States is one of the production of Glabridin earlier manufacturers . In addition, Lancome, Dior, Sonia Rykiel, Chanel ,and so on, meanwhile, has been widespread use of this product. Glabridin is extracted from Glycyrrhiza glabra L., and is the best whiten active ingredient in licorice. Experiment prove that it can penetrate the skin and maintain the internal highly active, effectively restrain a variety of enzyme activity during melanogenesis, especially in inhibiting the activity of tyrosinase, achieve whitening effect and effective antioxidant. 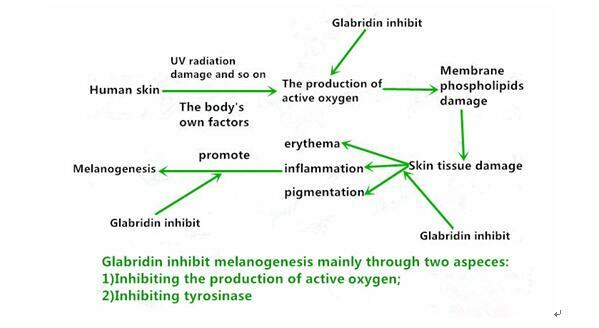 At the same time, Glabridin has effect to prevent the skin coarse , anti-inflammatory, antibacterial, and so on. In view of the above excellent effect, so Glabridin is one of the ingredients of all kinds of cosmetics (e.g., beauty cream, sunscreen, essence, lotion, shower gel, etc. ),especially used in the mask in recent years. (4) the antibacterial, and so on. It can add into all kinds of cosmetics and care (e.g., beauty cream, sunscreen, essence, lotion, shower gel, etc. ), especially in recent years, it also be one of the effective ingredients of a large number of used to mask with the wider application of facial mask at home.